The inner country bumpkin might require just a little more education concerning certain phenomena which for better or for worse have challenged my general perceptions, if there had been some in the first place. Interestingly, the mind seems genuinely captivated though the curiosity continues to tread in glaringly thin lines between what plays out from a naughty flick, and what doesn't. 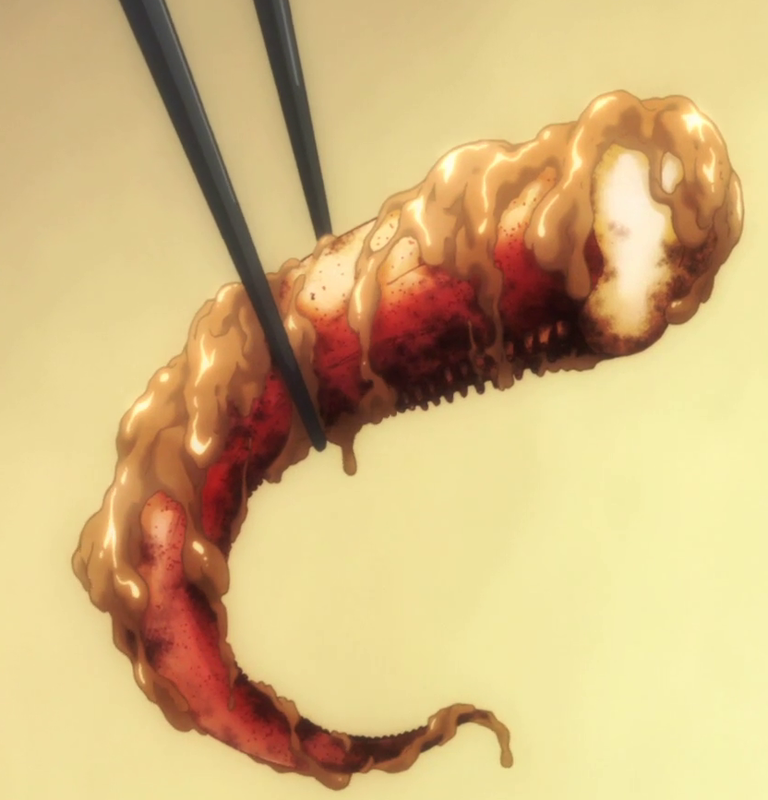 At a lethal risk of being stripped bare by stuff which normally wouldn't evoke such associations, I have decided to brave past the imprints of peanut butter-coated grilled squid tentacles that knew a little thing or two about fan service manhandling a school girl, and meat juices which had the godly abilities to cleanse the full monty while spurting over the intimate regions. 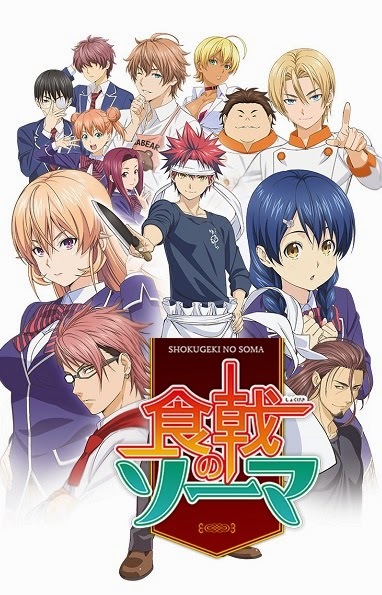 For the love of fried rice and anything nice, here is Shokugeki no Soma. I would like to think of myself as pretty liberal despite having no benchmark to weigh in my convictions. If there had ever been the slightest distaste, I reckon that it would probably be attributed to...well, never mind. A combination like this is nonetheless geared at full throttle. I believe that there is also something meant for the most prickly of prudes. How about some grilled squid tentacles drizzled in pure honey? 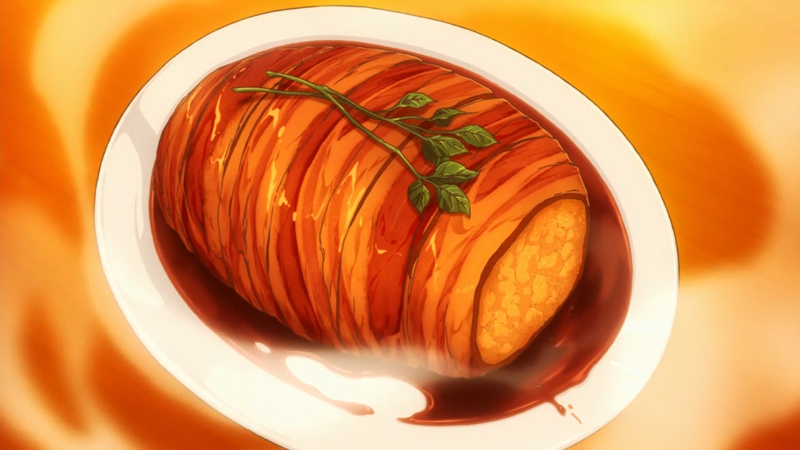 Contrary to what Tadokoro Megumi had effectively conveyed, I think that the dish is simply genius. Eh, who is Tadokoro Megumi you ask? She is Yukihira Souma's fellow classmate in Tootsuki Gakuen! Who is...okay, I just realised that I haven't quite mentioned anything concrete. Very well, I shall now attempt to dig up the foundations of this absolutely orgasmic (pun seriously intended) series. 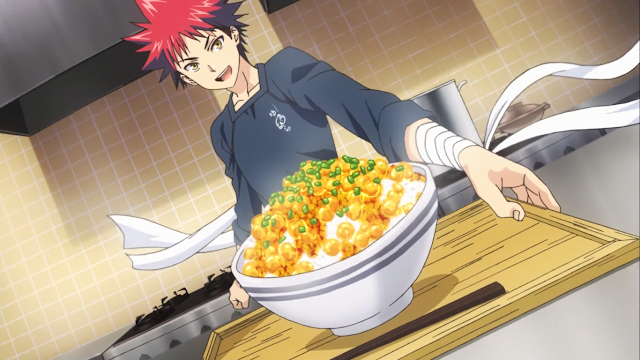 Prior to the Tootsuki Gakuen arc, Yukihira Souma was all set to refine his culinary skills right in the heart of his father Yukihira Jouichirou's diner after graduation from middle school. Souma is second to his father's abilities, but his unwavering determination to cook up dishes that are worthy of the diner's reputation and ultimately surpassing of his father's expertise is a potentially lethal weapon. He confidently fended off a group of ruthless urban planners bent on acquiring the diner with 'Roast Pork, Just Kidding' that was made using last-minute ingredients. Quite unfortunately, Jouichirou himself dropped a huge bomb on Souma by announcing his cooking tour abroad which meant closure of the diner, and Souma's transfer to Tootsuki Gakuen. The arc proper unveils with a rather turbulent encounter between Souma and Nakiri Erina, who holds the tenth seat in the Elite Ten Council and is essentially a [expletive removed] [derogatory term removed]. Sorry, I just can't find anything remotely likeable about Erina, despite her status and such. Anyway, Erina's [expletive removed] character forms the gist of her criticisms towards others and their culinary expertise, which could steer miles away from rationalism and everything else. She looks down on Souma regardless of his talents and efforts. 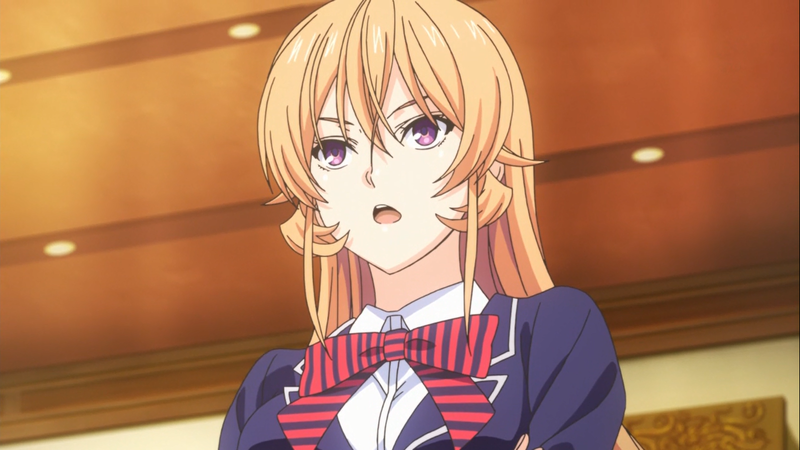 Erina had initially disqualified Souma as a potential candidate of Tootsuki Gakuen, but an extremely confident introduction from Souma during the school opening ceremony nearly threw her jaw out. 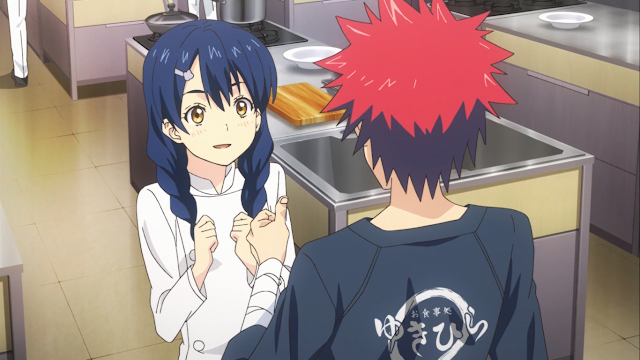 Anyway, there is something about Souma which to date remains unknown to Erina. 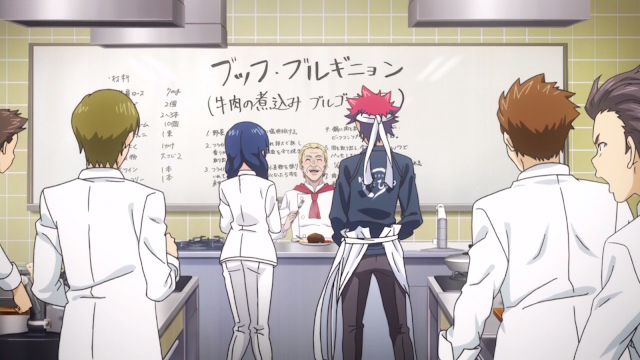 Souma and Megumi were paired up for their first assignment led by Roland Chapelle, who oversees the French Cuisine Division. Megumi's panicky state didn't help things but Souma's composure reassured success towards the end when Roland broke out of his usual no-nonsense frame and smiled. Naturally, the duo achieved the highest rating in the class (Roland expressed regret that he wasn't able to grade anything beyond an 'A'). I have to say that I'm mesmerised by the squid...I mean, this cooking series. 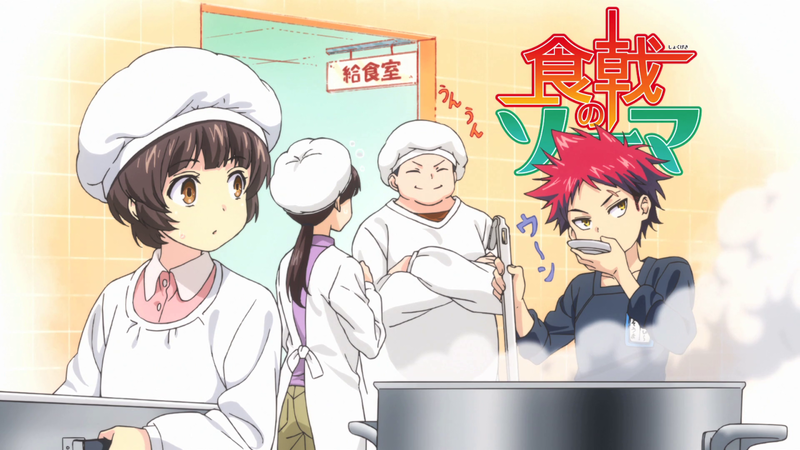 Shokugeki no Soma blends with generosity a wide array of creative elements, tickling the senses and working up numerous cravings while salivating at the screen. 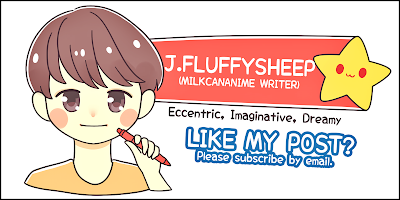 Maybe I will give the manga a shot as well! 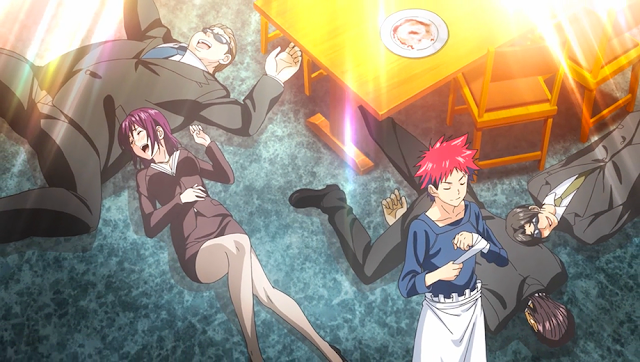 No Comment to " Shokugeki no Soma "